Good morning! So excited this morning to be hopping (haha - with a bunny card!) to celebrate the adorable newest Heffy Doodle Release! There is tons of inspiration and a great prize up for grabs, so make sure and hop along and check out the entire hop! 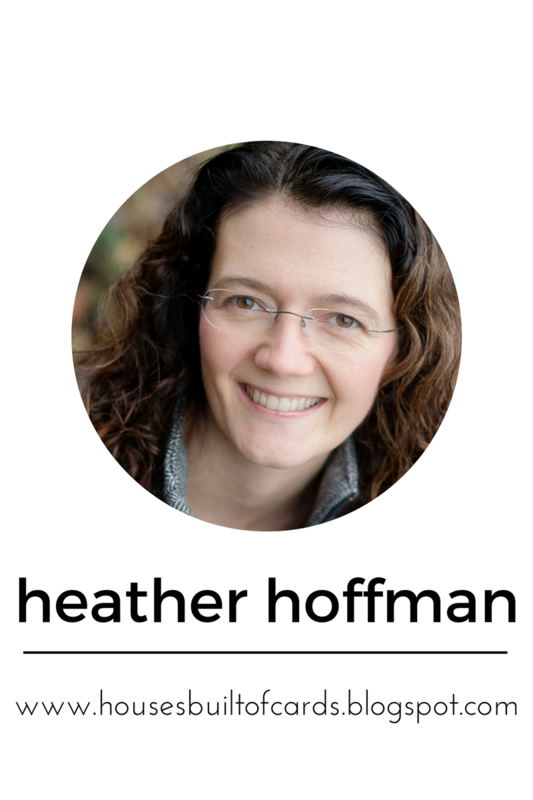 You should have arrived here from Justine Hovey, but can also head to the Heffy Doodle Blog to start at the beginning. Today I'm sharing one of my favorite cards with the new release! It is one of the many cards I made for display at Creativation and I had so much fun creating it! I thought this cheeky little bunny stealing a carrot was so fun! 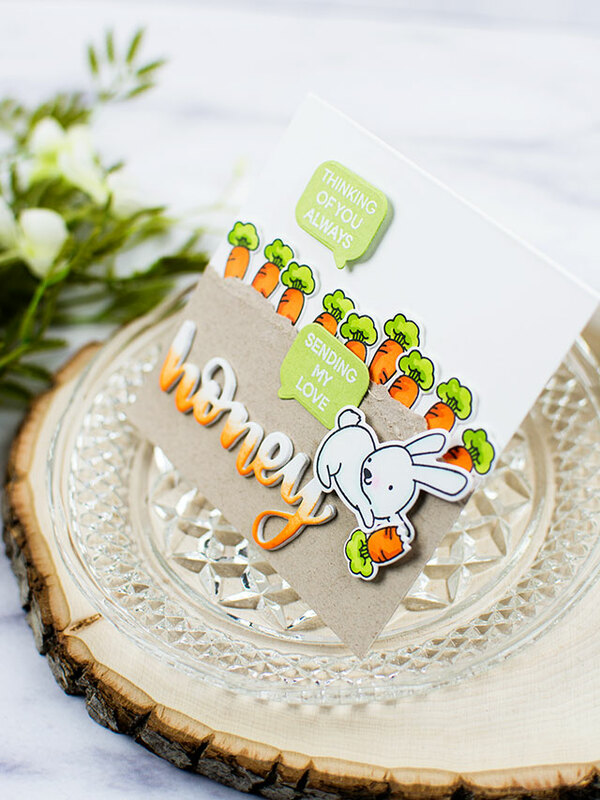 The Hunny Bunny Boo stamp set is full of the sweetest little pile of sweet bunnies! I used a white 4 1/4 x 4 1/4 card base (a new favorite size I've discovered!) 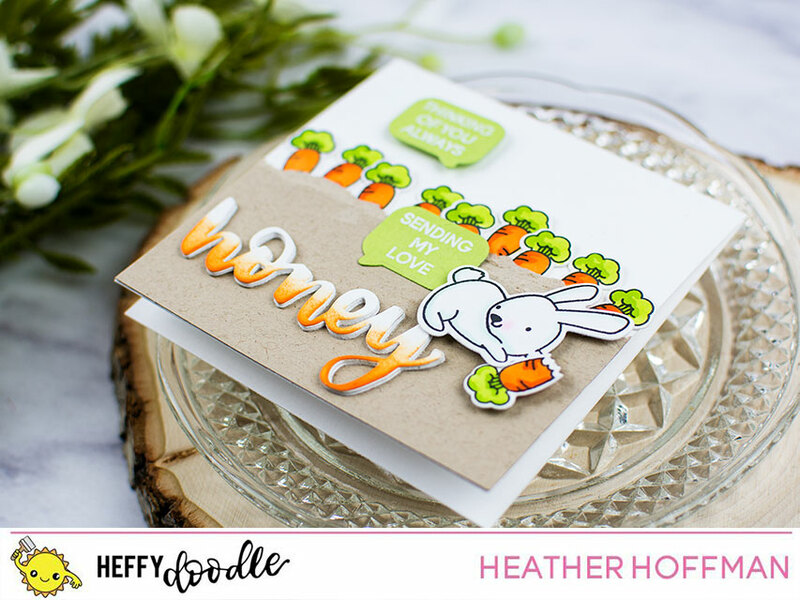 I stamped, colored, and die cut (with the coordinating Hunny Bunny Boo Dies) a whole pile of the carrots, then layered them underneath a bit of kraft cardstock with a torn edge to mimic dirt. I used the half eat carrot for the little bunny to hold onto, added them with foam tape. I die cut the Honey Word Die 3 times from white cardstock, and did some ink blending on the bottom of one, then layered them all together with a glue pen. Finished off by die cutting the tiny speech bubble from Whatcha' Sayin' Dies, and stamped and heat embossed a couple of the wee sentiments from Whatcha' Saying Stamp Set in the middle. The top one I adhered with foam tape, the bottom one right on the kraft. This gives different heights and dimension to the card which is fun! 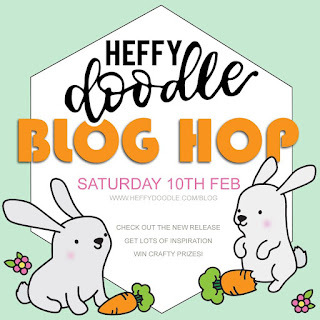 A random winner will be selected to receive a £25 gift certificate and free shipping to the Heffy Doodle Store! To be eligible, leave comments across the entire hop by 11:59 PM PST on 2/15/18. 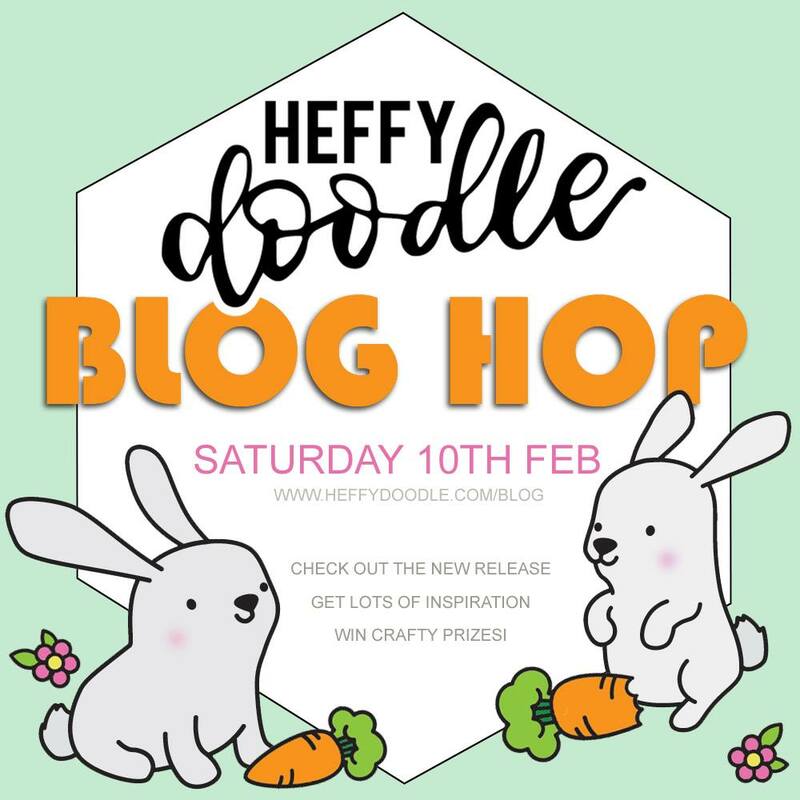 Winner will be announced on the Heffy Doodle Blog! This is just another stunning card and so different - I just love it and seeing all these great cards just inspires me so much. Thank you for creating such a great card. It reminds me of Peter Rabbit in Mr. McGregor's garden which I used to read to my twins (now aged 25) lol. Love it! Such a cute card, great idea for it in the first place, love how happy, bright and co ordinated the card is, thank you. Such a sweet card Heather...love the fun scenery! I love your sentiment dripping in honey and that adorable bunny! What a cute springy card... I love the garden you created. I love this stamp set and your card!!! Darling card! Love that sweet bunny! Sweet card. Love your use of the carrots! Oh how pretty! I love your colour selection especially! That's my favourite shade of green and it really pops with your vibrant orange carrots. Love it! out of it is a fun idea. Really cute card with the bunny in his carrot patch! WOW!! Absolutely adorable design! Love the torn edge of the kraft coloured cardstock, it adds such a great texture to the card! Abd that row of carrots is too cute! Love! Love what you have done with the stamp set. Your cards are beautiful. Oh my world, I absolutely adore that! 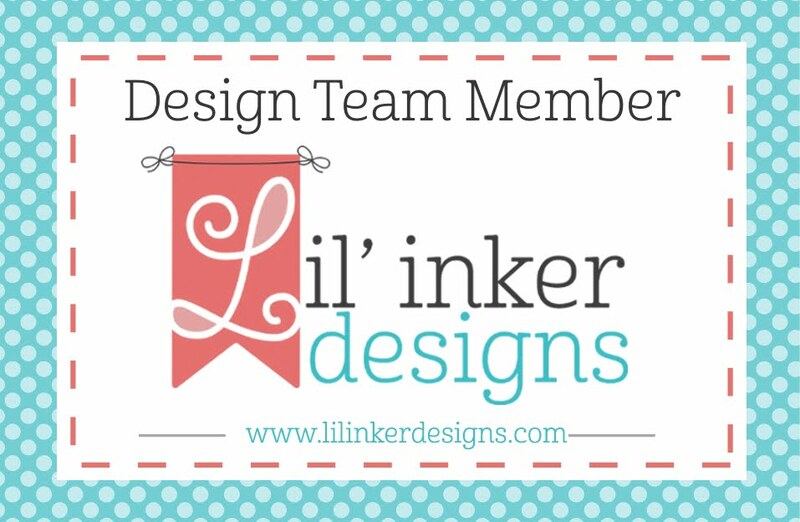 Wonderful design, great colouring, and that stamp set is sooooo cute! Thanks for sharing and inspiring! Super cute card- love the bunny and all those carrots. Seriously love this card!! That bunny is so sneaky....but my favorite is the "Honey" sentiment. My granddaughters call me "Honey" as my grandma name, so of course I must have this die!! Lol. Cutest card! Love it! Neat how you made the ground! Oh, this may be the most gorgeous and fun creation! Somebunny's going to love getting this card! Awww!!! How cute!!! Love your sweet card!!! Your card is truly adorable !! I love the gradient color on the sentiment. And these carrots !! I could eat them !! Fun card! Looking at it just makes me smile! Love how the bunny is able to hold the carrot! 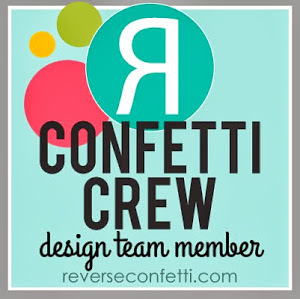 A Fun and creative release from Heffy Doodle! Oh my goodness, Kelly, your card is too cute! St patty's Day is often overlooked, so this was a wonderful surprise. Wonderful new release by Heffy Doodle and I'm so glad she included this little leprechaun He's just too cute! Cute scene you created for your card! I love the way you ink blended the Honey die, it really makes it stand out!